A really good use for leftover bread is to turn it into a vegetable bread pudding. You can essentially use any seasonal vegetable instead of pumpkin. Cut the pumpkin or squash in half, remove the seeds and membranes with a large spoon and discard, place the pumpkin cut side down on a lightly oiled baking sheet. Bake in a 350 degree oven for about 40 minutes, until the pumpkin is soft when pierced with a fork. Remove from the oven and let cool. 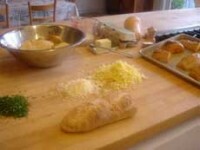 Place the bread in a single layer in a shallow dish. Pour 2-1/2 cups milk over the top. Let soak until the bread has absorbed the milk and becomes soft, about 30 minutes. Press the bread slices to extract the milk. Measure the milk, you should have Â½ cup milk left after squeezing. If not, make up the differnce with the additional 1/2 cup milk as needed. Set the milk and bread aside. While the bread is soaking, remove the skin from the pumpkin and slice the cooked pumpkin in 1/2 inch wide slices. Preheat an oven to 350 degrees. Butter a 3/4 quart mold — a souffle dish works well. In a bowl beat together the eggs, salt, pepper and the 1/2 cup milk until well blended. Layer one-third of the bread in the prepared dish. 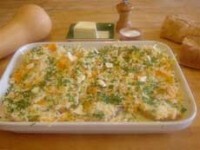 Place a layer of pumpkin on top of the bread layer sprinkle with half of Gruyere cheese and the mixed herbs. 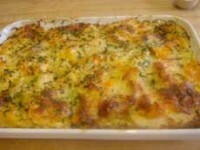 Repeat with another layer of bread, then pumpkin, then cheese and herbs. Cover with the remaining bread. Pour the milk-egg mixture over the bread. Dot with butter and sprinkle with the Parmesan Cheese. Bake in a 350 degree oven until the top is crusty brown and a knife inserted in the middle of the pudding comes out clean, about 45 minutes.